InterActiveHealth Recent Blogs Are You Getting Sick of Pink Ribbons? 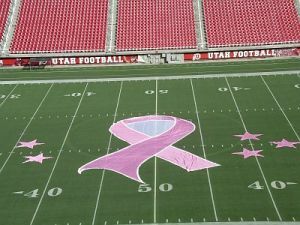 Every year October is designated as Breast Cancer Awareness Month. Pink ribbons can be found on anything and everything. Recently I have been wondering, after watching clips and seeing family members from my uncle’s dog to a long lost cousin sport a pink ribbon, that it may be too much. After so much attention have we become numb to the actual message? Breast Cancer is a difficult and terrible diagnosis. Often we hear about the success stories of those who have made it through this disease. We often aren’t told about those who don’t. Though, the memories of those lost to breast cancer are always close to the family members of those who lost their battle. Additionally there has been some discussion about being to aware and fear overtaking the mass. Are we over checking for breast cancer. Are young women much too worried about the possible diagnosis of breast cancer. Many argue that screening mammograms are out of control. Everyone from the twenty year old to the forty year old is now waiting to get a mammogram. Is this the best option is pivotal for discussion. There is a large difference. Screening Mammogram are done without any symptoms or findings. Diagnostic mammograms are done after a lump is found or another concerning symptom has been found. The difference is who will be getting the mammogram. Screening mammograms are very controversial and much has been written and studied. Diagnostic mammograms have very little controversy. There are several things to think about as a women of any age. 1.) Are you at risk? 2.) Do you have symptoms? 3.) Is there a family history? 4.) Have you spoken with your Physician or Mid-level Provider? Essentially the idea of Breast Cancer Awareness month was something of a good thing. Now we are so used to seeing and hearing about it that it may actually push some people away from doing what they need to do. The person who needs the message may not be the one getting it. Those who need to see their provider may not be the one who can actually get an appointment. Be reasonable about your risk and the risk of your family. Be honest with yourself if you find something concerning such as a lump. Don’t be afraid to speak with someone, especially a family member and your provider. Don’t get overworked and try not to get desensitized by the public push for an entire month of pink ribbons. Understand that this topic is important and should not be overlooked. 0 Responses to Are You Getting Sick of Pink Ribbons?